Miriah Meyer is in London for the O'Reilly Velocity conference and will be visiting City to give a giCentre co-ordinated Departmental Seminar. Miriah runs the Visualization Design Lab at the SCI Institute. She is well known in the visualization community for innovative visualization designs that have been used in a range of disciplines (MizBee, PathLine, MulteeSum, Poemage) and her authorship of the highly influential Design Study Methodology. A great speaker (even with jet-lag), Miriah is well-known for her excellent TEDx and Pop-Tech talks on visualization and has received a host of awards and is listed as one of the top young innovators in MIT Technology Review's TR35. Please come along to what should be an exciting tour through some of the best applied visualization research of the last decade- we will be done in one hour! 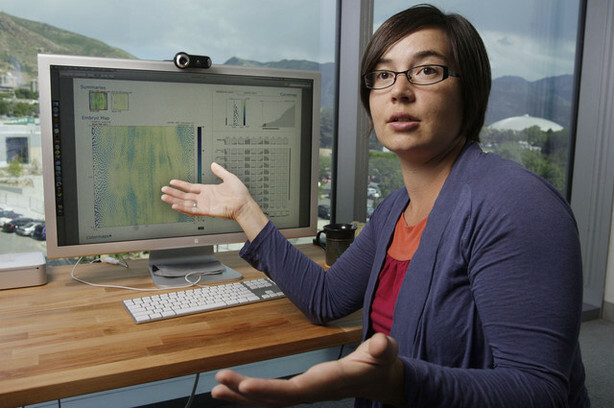 Miriah is an associate professor in the School of Computing at the University of Utah and a faculty member in the Scientific Computing and Imaging Institute. Together with Alex Lex she runs the Visualization Design Lab, which focuses on the design of visualization systems for helping researchers make sense of complex data. She obtained her bachelors degree in astronomy and astrophysics at Penn State University, and earned a PhD in computer science from the University of Utah. Prior to joining the faculty at Utah, Miriah was a postdoctoral research fellow at Harvard University and a visiting scientist at the Broad Institute of MIT and Harvard. Miriah is the recipient of a NSF CAREER grant, a Microsoft Research Faculty Fellowship, and a NSF/CRA Computing Innovation Fellow award. She was named a University of Utah Distinguished Alumni, both a TED Fellow and a PopTech Science Fellow, and included on MIT Technology Review's TR35 list of the top young innovators. She was also awarded an AAAS Mass Media Fellowship that landed her a stint as a science writer for the Chicago Tribune. Designing effective visualizations requires a careful consideration of factors beyond aesthetics and functionality — it requires deeply understanding the needs, intuitions, and goals of target users. Visualization design studies are a methodical approach for acquiring this understanding. In this talk I’ll discuss the way we conduct design studies in my lab, which has a focus on designing for domain experts. I’ll also layout some open challenges in design study research along with a several proposed solutions that we’ve developed.